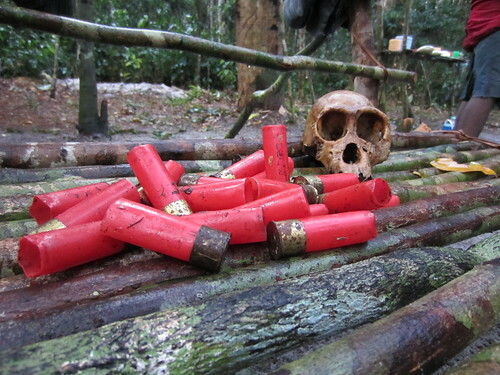 Poachers’cartridges and bonobo skull collected from the Park. I first got word of the ambush on Sunday, by satellite phone, while still in Kinshasa: “today, poachers ambushed TL2 team. 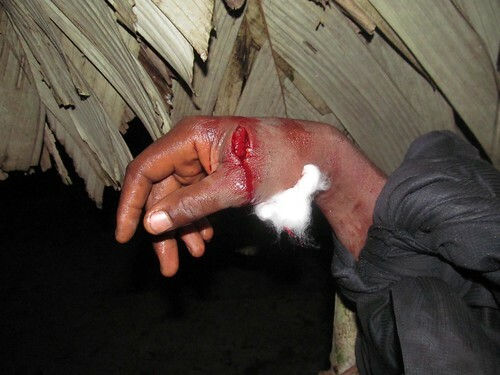 Boni was stabbed with machete.” I flew to Kindu the following day, October 9th. I went with Salumu, our TL2 coordinator in Kindu, to explain the case at army headquarters. The lieutenant assigned Major Bashimbe and two other military to accompany us to Chombe Kilima. 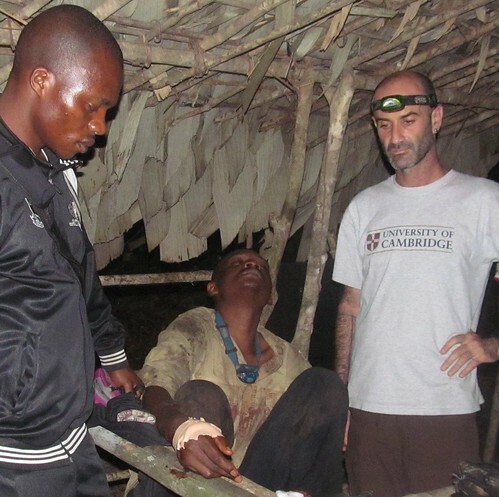 To staunch the flow of blood, Boni holds hand in air with make-shift tourniquet made from DieuDonné’s shirt. DieuDonné on left binding the poachers hands and elbows. 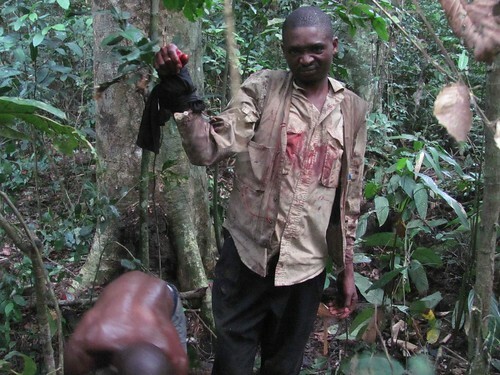 Boni’s team caught two of the poachers, but held them in the forest. Only when they were sure we were leaving Kindu, a group of TL2 field hands marched the prisoners to meet us. We all arrived the same evening at Chombe Kilima, the little village at the end of the road. One of the captives was the hunter with the shotgun, Ongona Nene. The other, Mopau, was one of his porters. The other five had fled through the forest. 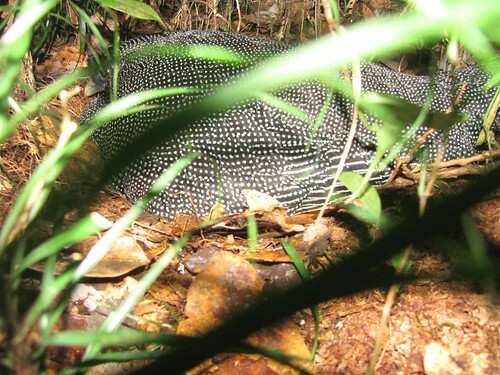 They had killed 8 forest antelope and 11 monkeys including the completely protected black and white colobus. 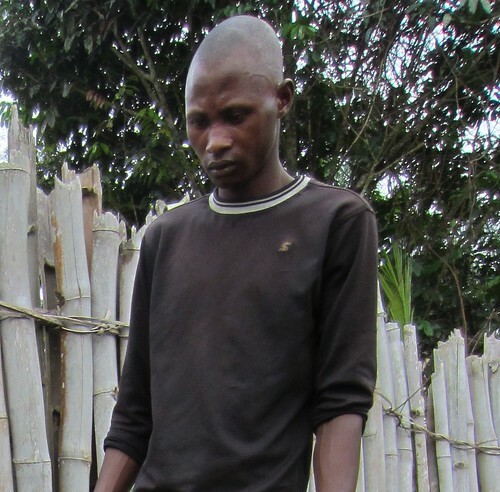 Edmon is the name of the poacher who tried to kill our Boni with a machete – Edmon got away through the forest. Katopa camp is on the western border of the park. 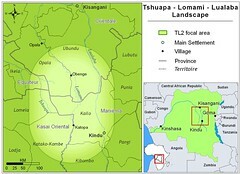 Chombe Kilima is to the east. 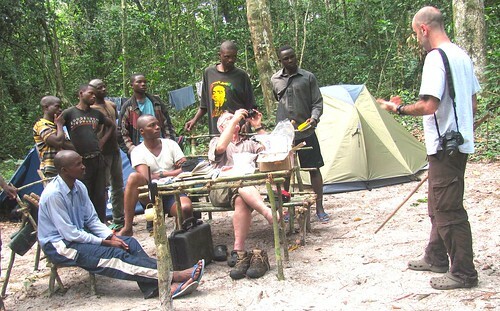 KK/4 is one of the small research camps within the park. 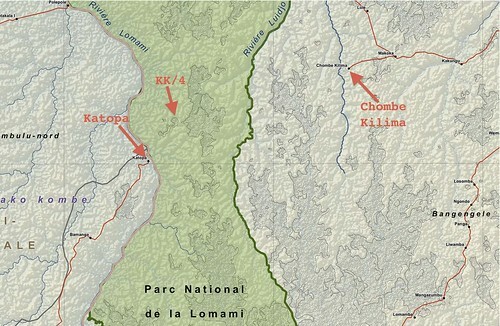 The hike from Chombe to Katopa is just under 40km. We arrived with Major Bashimbe in Chombe Kilima Thursday evening, 12th of October. 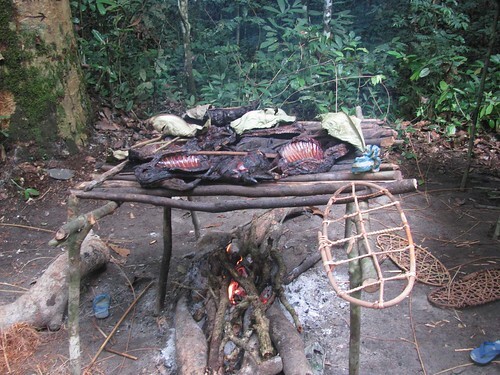 The military were to officially arrest the poachers, and then Salumu and I would walk to Katopa to check on Boni. 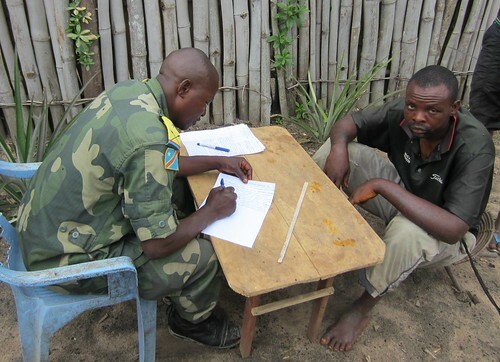 The Major speaks with the poacher in Chombe Kilima. We were all up before dawn the morning of the 13th. In a half light, whose only sounds were the last night cries of the forest hyrax and the first trumpet of the village rooster, Major Bashimbe brought Nene out of the small windowless mud-wattle room where he was “incarcerated” overnight. Major Bashimbe, sat in a dilapidated plastic chair and leaned across a small hand-hewn table to interrogate the poacher. His posture was reassuring, his tone half-confiding. The interrogation went on for a good 45 minutes. “I was hunting”, Nene admitted, but everything else he denied. Holding up his hands, swollen from the tight binding, he insisted his 12 caliber shotgun went off only accidentally after Boni jumped on him. Jean-Pierre answering Major Bashimbe’s questions. Major Bashimbe nodded, listening to him complain at the treatment he had received at the hands of TL2 researchers. Bashimbe finished his notes, dismissed him and called one of our team, Jean Pierre, who had been present at the forest confrontation on Sunday. Our teams always have at least one camera to document animal sign, they document other discoveries that please them as well. 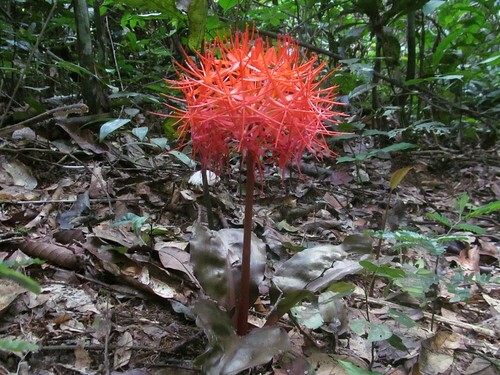 This Amaryllis is from Boni’s camera the morning before they stumbled on the poachers’ camp. 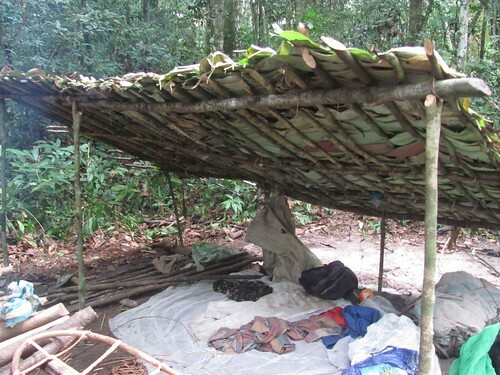 Where the poachers slept. In the back-right a pile of dried meat, covered to keep off flies. Their most recent kills being smoke dried. 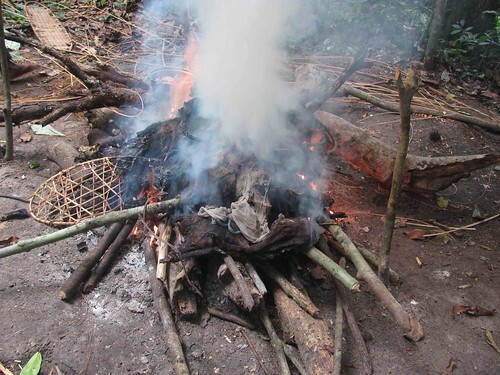 One by one Boni and his team threw the dried carcasses on the fire. Jean Pierre continued in a quiet, matter-of-fact voice, standing in front of Major Bashimbe. Boni directed the burning of all the meat; Jean Pierre carefully recording it all on camera as usual. Then they started to lead the prisoners back to KK/4; it was already late in the afternoon. They knew to be very alert because the prisoners had told them the main hunter was still in the forest. This picture was taken a month ago at KK/4. The researcher, Paco, is explaining his work to John and some of the team. Christian is to the far right behind John. Boni is beside him. JP is sitting beside John and Xavier is also sitting with his legs outstretched. The shortest person, in the striped shirt standing to the left is DieuDonné. I heard this same story three times, always the same, but always with the details of a different person’s point of view. First Jean Pierre’s version, then on the hike across the forests and savannas to Katopa, I walked with DieuDonné, “Jamais tombé” or “Never fallen” they call him and I saw why. Short, but lithe and extremely solid, he heaved the outsize pelican up on his head and took off at a pace that had me half running behind. Waist high water, clumpy flooded savanna never slowed his stride or his animated dialogues. Five had fled, the team had the gun and two prisoners, but Boni was losing a lot of blood. The first care was from what Paco had in his medicine kit at KK/4. The next day Boni went to the main basecamp, Katopa. After first cleaning of one of Boni’s two major wounds. “That was when Jean Pierre came hurdling at Edmon from the back. I left the porter and came running too. Jean Pierre pulled Edmon back, but he twisted free and ran away. I wrenched the shotgun away and threw it, then I grabbed Nene’s arms behind his back and started binding, real tight. ‘I shoot’, Jean Pierre said picking up the shotgun. Boni got up and stepped away. ‘No don’t shoot’, he said. There was blood everywhere. 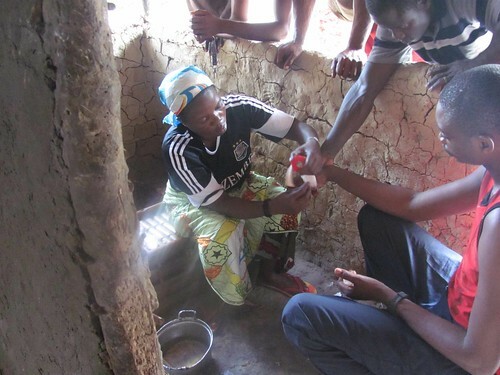 Later Boni told me that he did not even know that he had been hurt until he saw all the blood. Then he realized his hand was throbbing and the blood was spurting out of it all over the ground. The nurse visiting Katopa did an excellent job of keeping infection out of Boni’s wound but – unfortunately – there was no possibility of stitches and there was no possibility of blood transfusion. Nevertheless, in our kit we had the antibiotics, the antiseptics and clean gauze. Salumu and I brought anti-tetanus serum. That morning in Chombe Kilima, the only evidence that Major Bashimbe had was Nene’s word against Jean Pierre’s word. Boni, even if there was no infection, wouldn’t be fit to make the walk out for a week or more. Edmon and the others had fled and were lying low who knows where. Suddenly, I was worried that I might not be able to insist that Nene stay in prison. What if Nene’s family came up with 8 or 10 goats to bribe the right person? With no strong evidence it would be easy to liberate him. After Jean Pierre was done talking, Major Bashimbe thought for a minute, “Bring them both out”, he said. The military sat both Nene and Mopau in front of the low table. I was on one side and Jean Pierre was in the back. I felt sorry for Mopau. He was just a porter, hardly more than a boy, earning a bit of money. Nene on the left. Mopau, the thinner, younger one on the right. “Now, Mopau” Major Bashimbe addressed him in a kind voice, “who was it who fired the shotgun?” Silence. Mopau looked at the ground and then slowly pointed his finger at Nene. “Mmm,” Major Bashimbe acknowledged. “Now that was before you guys were wrestling, or was it during the ruckus?” Mopau looked at Major Bashimbe a long minute, then whispered “before”. Bashimbe smiled and scribbled quickly to finish his proces verbal. The next day, after Salumu and I arrived at Katopa camp, our driver in Kindu sent word to the camp satellite phone that Nene was in the central prison. I hope this is a lesson that reachs all the poachers and would be poachers in the future Parc National de la Lomami. This edict makes the southern section of the future Park a protected area under provinicial law with all the same restrictions (no hunting among others) as a national park. The pictures below were also on Boni’s camera taken just before the photos in the poacher’s camp. He is one of our best naturalists — may he not be discouraged! 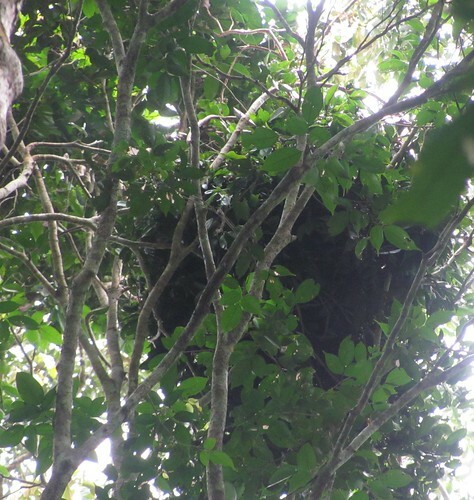 A bonobo nest in the forest canopy. This entry was written by Terese Hart, posted on 2012-10-22 at 9:40 am, filed under Bushmeat, Law and Order. Bookmark the permalink. Follow any comments here with the RSS feed for this post. Post a comment or leave a trackback: Trackback URL. WOW – Mama, please tell Boni I am thinking of him. What he and his team did in the pori was brave and truly remarkable. Inspiring. I hope his wounds heal quickly and that a clear message goes out to poachers. I am leaving a donation. Please can you give Boni some of it and tell him that many people around the world are thinking of him and are so very proud of his actions to protect wildlife and his countries natural heritage. Oh dear! I’m so glad that Boni will be okay! What brave, brave men! I agree with Dieudonné’s assessment of Boni…he’s a real man and a hero. I hope his hand heals without complications. The outcome here could have been far worse. Theirs is dangerous work. Thanks for sharing this remarkable (but sad) story. I’m sorry it’s such a dreadful story, but I’m relieved it had a happy ending. Although I was terribly worried as I read this, I had to smile at the photos. You not only have a brave crew, they’re also real researchers: when things get tough they keep documenting it with photos! Thank you for such careful reporting Terese. I am so sorry Boni was hurt. The TL2 team at KK/4 made amazing decisions that day to protect TL2, and let the story of their win of the fight with the poachers spread quickly down the Lomami. Incredible and frightening story. I’m so glad everyone’s okay. Please tell Boni and the rest of his team we’re glad they’re okay and thank them for their bravery and resilience. 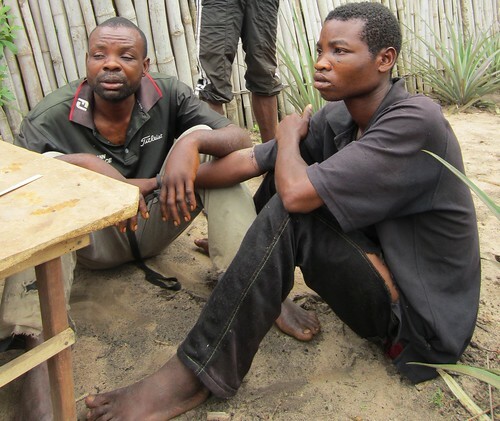 Please tell us why they weren’t armed, and if not, why did they engage the poachers? Tan, Much later but I was re-reading the questions and thought I would answer it as I now have more perspective. Although I did not know it at the time, Boni once served in the presidential guard — he was trained to save lives (one life in particular). The poacher was preparing to shoot again. He dove for him. If this had been an automatic, as in the USA, our guys would not have had a chance. This was a 12 caliber shotgun and an expert hunter.